We have updated our DeckStainhelp.com site with numerous new reviews and articles. The site has also gone under a major renovation to the structure and look. We made it easier to navigate and find deck stain help articles and reviews. We also improved our comment system by adding the ability to upload pictures of your deck when asking questions or making a review. Here at DeckStainHelp.com we take pride in the fact that we have become the Internet’s go-to site for all things exterior wood and deck restoration related. Hearing from our customers who have used TWP 100 Series wood, their decks have held up to the test of time and weather after this harsh winter. TWP is one of our top go-to stains as deck restoration contractors and we have been using it for 15+ years. As always, we appreciate your input, so feel free to leave a comment below and pictures of your completed projects if you have them. Important Note: This is our 3rd Review of TWP 100 Series. TWP 100 “Total Wood Preservative” Deck Stain protects and maintains all exterior wooden surfaces. TWP Wood Stain is a special blend of chemicals in a contractor grade formula that safeguards and protects exterior wooden surfaces. TWP® 100 SERIES penetrates deeply into wood without excessive surface film build, highlighting existing grain patterns with amazing clarity and warmth and is specifically designed to provide protection against the four major causes of wood degradation: wood rot, water, sunlight & mildew. 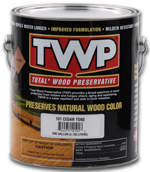 TWP Exterior Wood Preservatives are the only wood and deck stains on the market that are registered as exterior wood preservatives by the EPA. – We prepped the deck first with the Gemini Restore Kit and applied the TWP 120 Pecan color after a few days of drying. This deck was originally done with the TWP 101 Cedartone. The customer wanted to use the Pecan this time as it has a slight “brown” tone. The overall appearance was excellent. – Same as the first time tested, The TWP Pecan 120 retained about 80% of the original color after 2 years of full exposure to the elements. – Very minor or no wearing of the TWP. TWP penetrates very well into the wood grain so this is normal and expected. We here at Deckstainhelp.com remain committed to being your source for industry insights and trends for the perfect deck stain project execution. See below for information on consumer report insights in 2019. We want to hear from you. Leave us a comment below. The Consumer Reports is the publication of the Consumer’s Union. Many consumers use the publication when making a buying decision. After all, it publishes the ratings of other consumers who have bought the same products. So it would seem a logical place to gather buying information right? Well maybe not. The Consumer Reports publication has long been accused of biased ratings. This is especially true in the car industry. You can find countless articles of Consumer Reports being falsely suggestive in some of their ratings. Unfair testing and biased ratings seem to be common. More than a dozen large companies, from car manufacturers to electronic companies have sued Consumer Reports over the years. It almost seems like, for whatever reason, they tend to sway the results of tests and ratings. Here at DeckStainHelp.com, we take pride in the fact that we have become the Internet’s number one reference for your deck stain opinions and unbiased reviews. Our customers who have used Cabot Australian Timber Oil continue to give mixed reviews about the appearance and longevity of their deck stain projects. 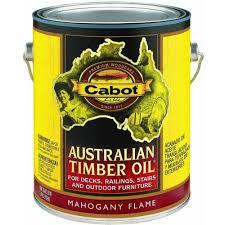 If you have used Cabot Australian Timber Oil, we would like to hear what you think, so feel free to leave a comment below and pictures of your completed projects if you have them. Containing a precise blend of superb-grade linseed oil for maximum penetration, long-oil alkyds for durability and pure South American tung oil for color depth and water repellency, Cabot Australian Timber Oil delivers three-way oil protection and a beautiful hardwood stain. In addition, complex translucent iron oxide pigments are added to ensure a lasting U.V.-absorbing surface rich with color and dimension. The result after years of development is an advanced-technology treatment of unrivaled performance designed to protect your wood surfaces like never before. – The Mahogany Flame looks very red but overall very rich and nice looking on the PTP test deck. All grain was visible and not “covered” by the semi-transparent pigment. -The Australian Timber Oil performed decently at the 2-year mark. It had retained about 60% of the original color. Here at DeckStainHelp.com, we have worked hard to become the Internet’s number one reference for your deck stain opinions and unbiased reviews. We thank you for your continued support. Our customers who have used Benjamin Moore Arborcoat Stain continue to give poor reviews about the appearance and longevity of their deck stain projects. If you have used Benjamin Moore Arborcoat Stain, we would like to hear what you think, so feel free to leave a comment below and pictures of your completed projects if you have them. 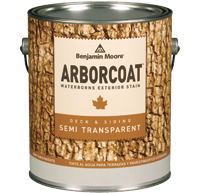 – Similar to our first review, the Arborcoat after drying had a “plastic” unnatural look to the wood when done. The finished result was a film-forming stain, similar to a varnish. – The Arborcoat does well with UV protection. It has a high solid content, similar to paint. We did use the top coat clear on this deck as well. Not sure if that actually helps with UV protection, but BM claims it does. – This product does not perform well on our tests. It is prone to peeling and wearing. After 2 years much if not all of the flooring had peeling issues. Cracking, peeling and mold growth was evident throughout.